My milk jug gets a second life. My youngest son goes through milk like you wouldn't believe, I often joke that if we lived in a less urban area I would buy a cow. It's that bad. I recently discovered that we can buy organic dry milk, which would save on waste but I would have to order it online because none of the health food stores in my area carry it. So we end up with a recycling bin filled with milk jugs. I've turned this gallon jug into a bath toy scoop. I simply cut part of the jug off, opposite the handle. And then I turned it upside down and literally jabbed scissors into the bottom repeatedly to create holes for water to drain out of. 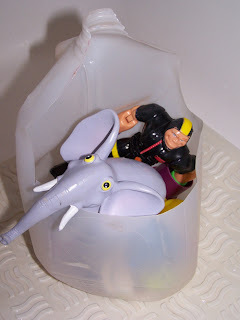 Now when my hubby gives the kids a bath he can scoop all of the toys in the jug and allow them to drip dry. At one point in my life of many apartments, this would have come in handy to store my shampoo, conditioner, facial scrub etc. since in our bathtub we didn't have the storage to hold anything in the tub. I've also created one to hold gardening tools. I am SO making one of these TODAY! Those toys in the tub make me nuts!